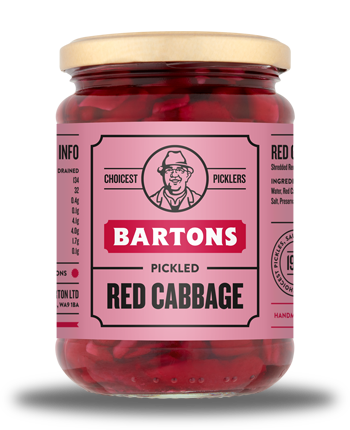 Bartons Pickled Red Cabbage is another very typical traditional Pickle consisting of shredded red cabbage, pickled and preserved in vinegar and salt. Pickled Red Cabbage is a great accompaniment to a Lancashire Hot Pot which is a hot meat and vegetable stew. It is also a very popular tangy, crunchy, sweet and sour component to a fresh salad. 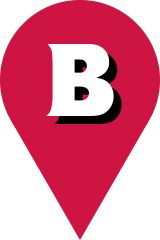 It is also an ideal super cool side to a Hot Dog or Barbequed Sausage in a bread roll. Why not try making a simple braised red cabbage with apple by draining the red cabbage and gently cooking it in a pan on a medium heat for 10 minutes with a large spoonful of Bartons Apple Sauce, a spoonful of sugar and either a spoonful of the reserved red cabbage vinegar or a splash of Bartons Malt Vinegar. For those who need more than a jar, we also have catering sizes. Water, shredded red cabbage (54.12%), acetic acid, spirit vinegar, salt.